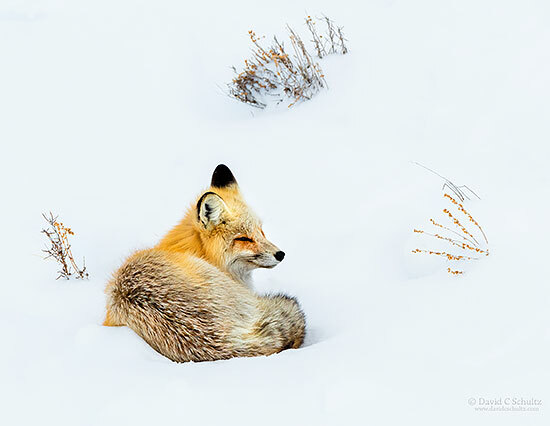 It has been a very successful and fun season for my Yellowstone winter photography tours that I’ve held so far this year. I thought I’d take a moment to share a few of the images captured along the way including the shot above of the river otters. As many times as I’ve toured through Yellowstone National Park I’ve never had the opportunity to photograph river otters. 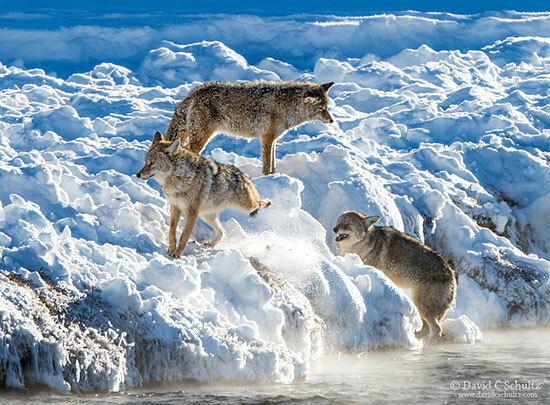 Here in this shot they were keeping a close eye on us as they played around on the mostly frozen over Yellowstone River. The otters had several holes they would pop out of which were mostly hidden from our point of view. I counted at least 4 but I have a feeling there were a few more around. They certainly seemed to have an excellent source of food as each time we spotted them at least one had a fish in its mouth. 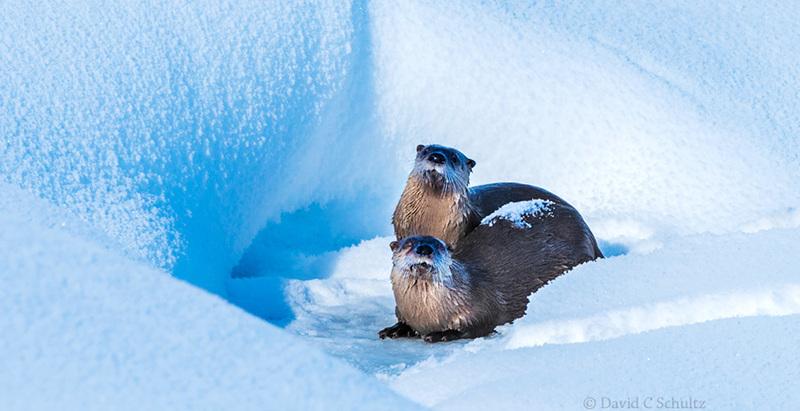 A relative of the weasel, the river otter has thick fur that protects it against Yellowstone’s icy winters. They can stay submerged for 2-3 minutes. Oh yeah…they are also adorable to watch and photograph! Two days earlier we spotted nine wolves in a pack but they were a little too far away to photograph. 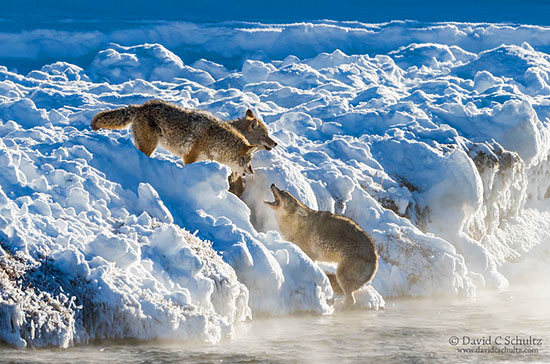 Another interesting moment we had the opportunity to spend time watching and photographing was a little disagreement between a few coyotes in Yellowstone captured during my last photo tour. We watched 4 coyotes, one was up in the trees, all getting along at first then things turned a bit ugly. Two ganged up on one as seen here. They tried to force the one off the river bank and into the water. Lots of posturing and snarling but in the end no real damage done, except perhaps to an ego! During the commotion one of the coyotes on the bank turned around and kicked a bunch of snow into the others face. Rather funny moment bringing back the idea of the bully kicking sand in someones face. As we made our way through the Fountain Paint Pots area of Yellowstone we came upon this scene. 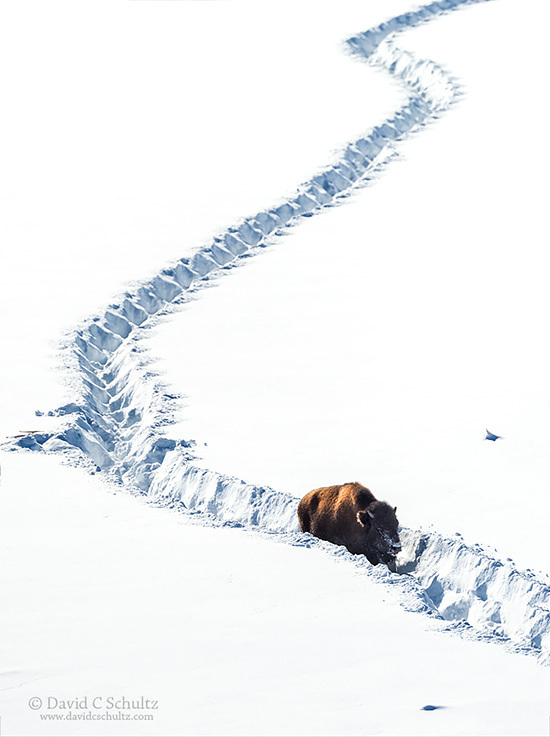 We watched a single young bison that appeared to be pretty stuck in this deep snow. Apparently it had tried to take a short cut across this meadow to get to the rest of the herd. It was interesting to watch the rest of the group come to its rescue. This image shows the last one heading in the direction of the youngster that was stuck. All ended well. 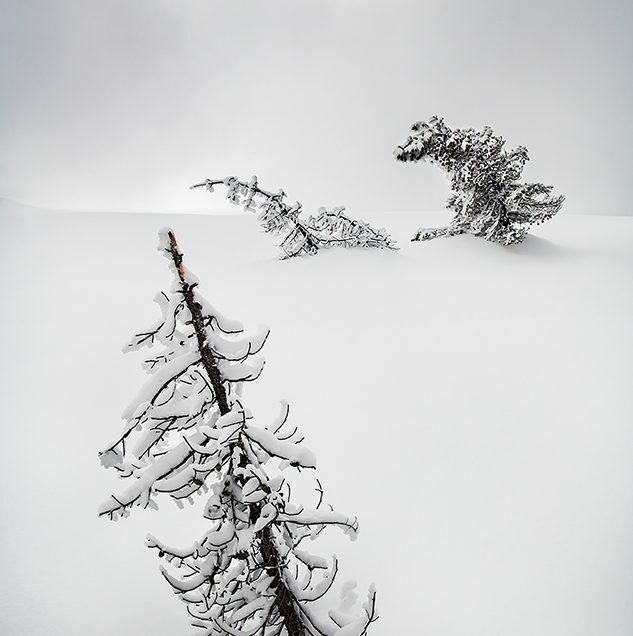 For me no trip to Yellowstone, especially in the winter, would be complete without spending some time photographing a few of my favorite trees, especially the dead ones! In this shot I loved the trees being back-lit. 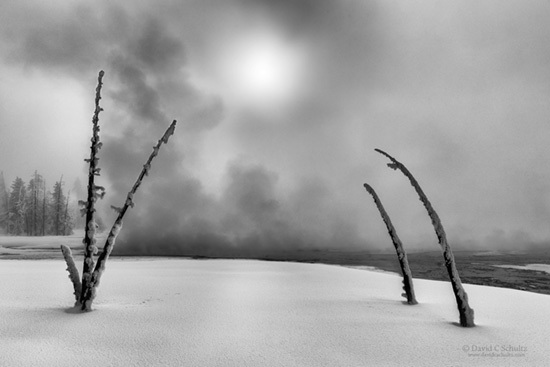 They appear to be reaching up to the sun which was being partially obscured by fog and steam from the nearby geysers. Because of the very monotone look of this photograph I processed it as a black and white shot. 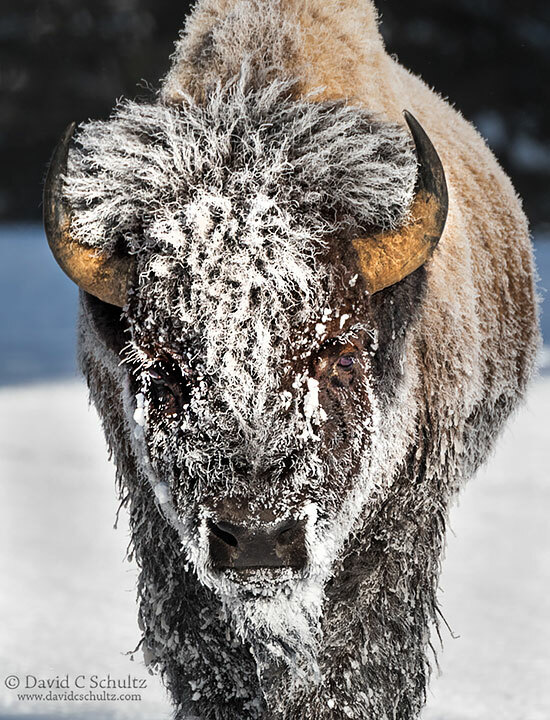 Of course there is always the Winter in Yellowstone signature shot we all seem to want to capture, that of a bison coated in frost. As it was -24f during a few of the mornings when we started out this was a fairly common scene, best shot with a long telephoto lens as these guys can cover a lot of ground in no time! If you’re interested in joining me on one of these semi-private tours, perhaps 2018 please check-out this link for more details. 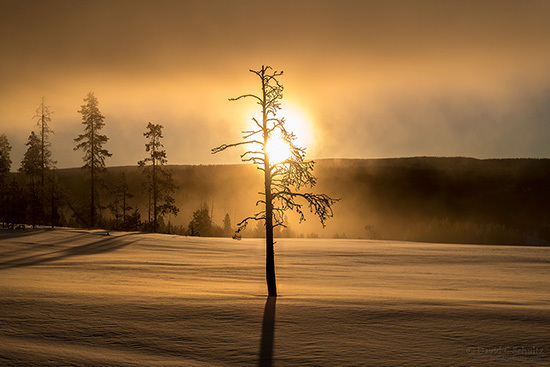 Each Winter in Yellowstone Photography Tour is limited to 2 guest so book early. To read what others have to say about this and other photography adventures I offer please have a look at my TripAdvisor Page.